Magicians, Dungeons and Dragons! Oh My! | Grand Central Magazine | Your Campus. Your Story. 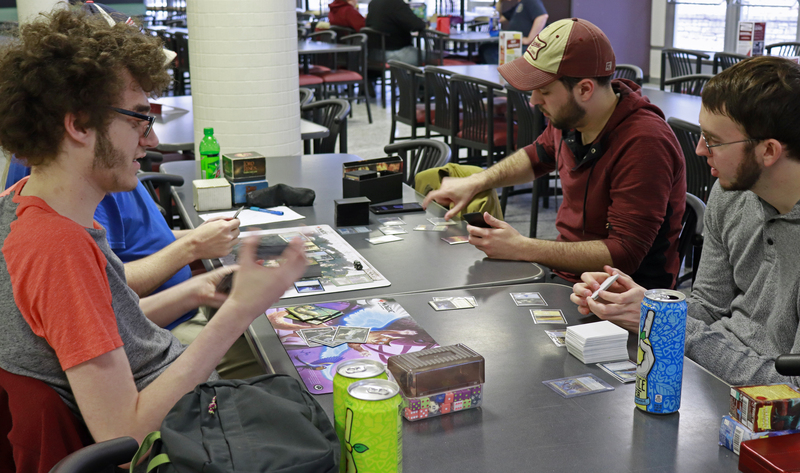 In the UC Down Under food court at Central Michigan University, four brave souls fight monsters and slay dragons. They’re gathered around a cafeteria table, intently bent over their dice as they listen to the Dungeon Master. The cafeteria table isn’t half as noble as the Round Table, but it gets the job done. They play Dungeons and Dragons. Junior TJ Powers, the Dungeon Master, paints a picture of a house shrouded in mist. Each player adds to the world they build around them, describing in vivid detail with their own unique spin what the imaginary world looks like. Senior Becca Struble steps into the life of her character—an elvish woman named Karma, with a quick wit and level head on her shoulders. Powers guides the story, keeping his players from straying too far from the plot he spent hours writing for this campaign. Typically, a Dungeon Master can spend a few hours to a few days planning a campaign. The longest campaign Powers has ever planned has been ongoing for two years. 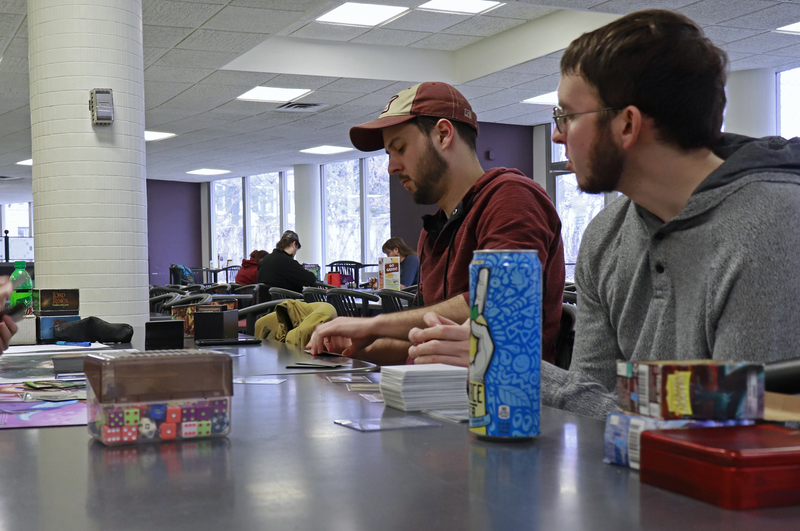 The club is a place for students with similar interests, self-described “nerds,” to meet and play games weekly. The club has over 20 members. Not everyone plays D&D though, early on in the night people break off into smaller groups to play different games such as Sci-Fi By Numbers and Magic The Gathering. Struble narrates her character’s movements, actions and voice. Her character Karma is the voice of reason in the group. Any decisions made in the game are through the players’ choices and the luck of the dice. Struble keeps her set of vibrant red, purple and gold dice in a pink and white frilly crocheted bag. She’s learning to crochet so she can make more custom dice bags for the members of her group. Struble also runs an online D&D session. 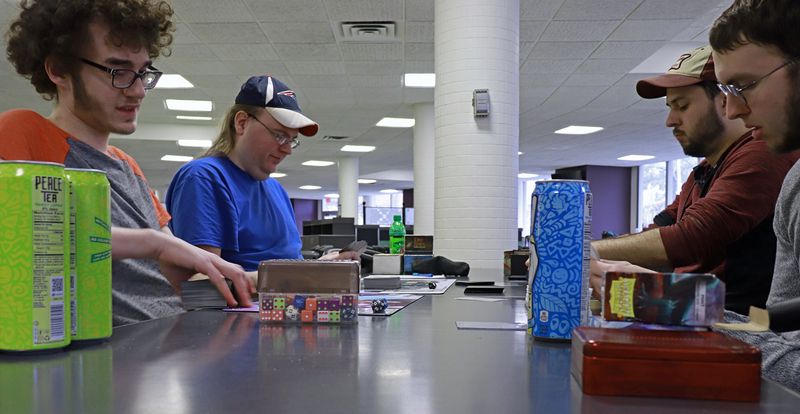 “Part of the reason more people are joining D&D is because you can learn and play online,” Struble said. New technology brings in a new generation of players. Virtual tabletop platforms like Fantasy Ground open up worlds of possibilities for players. The software allows people to have the full D&D experience, it creates a map, has “rolling” dice, and a chat forum that gives control to the Dungeon Master to lead the game and allow players to talk to each other. It isn’t cheap though, this version of online playing can cost up to $200 for the software and extension packs. There are other ways to connect and play online, such as Skype and online chat boards specifically dedicated to the game. CMU graduate Kathlyn Bernardoni, better known as Kat to her friends, grew up playing Dungeons and Dragons with her dad. He told her bed time stories of monsters and sorcerers battling, as she got older he passed the torch down to her and taught her how to play; it became their hobby together. “No matter where I move I’ll still play D&D,” she said. Bernardoni continues to come back to MPGA to play D&D with her friends. She’s been a part of Powers’s long-term campaign for the last two years. Looking around the club, it’s easy to pick out the few women who are there. To every five men is one woman. Since the creation of the game in 1977, a lot has changed. In the early versions of the game, female characters could not be equal in strength points to their male counterparts. 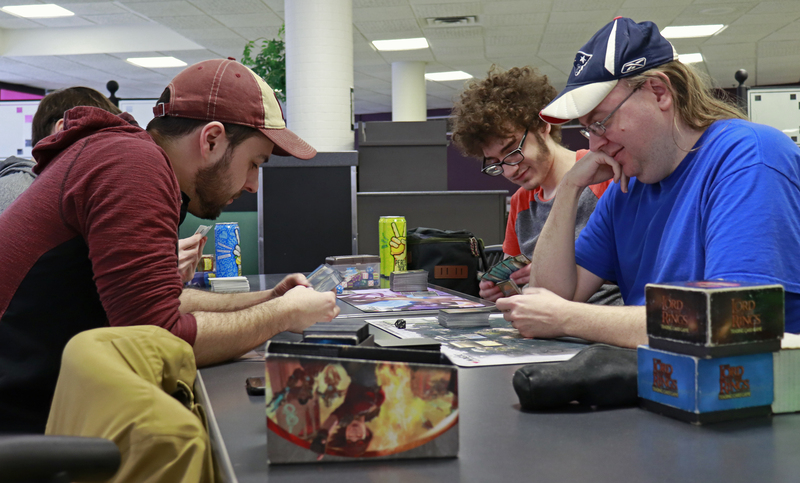 “It’s definitely changing over time, more and more girls are playing and becoming interested in D&D,” Struble said. The art, design and marketing for the game didn’t subtly hint at the demographic it was aiming for in the early years. Female “warriors” were hypersexualized in the art, which wasn’t exactly welcoming to the women who wanted to play. Since then however, the game has definitely made strides in the right direction. Wizards of the Coast, D&D’s parent company, created a two-year testing period specifically for the newest version of the game to be as inclusive as possible. 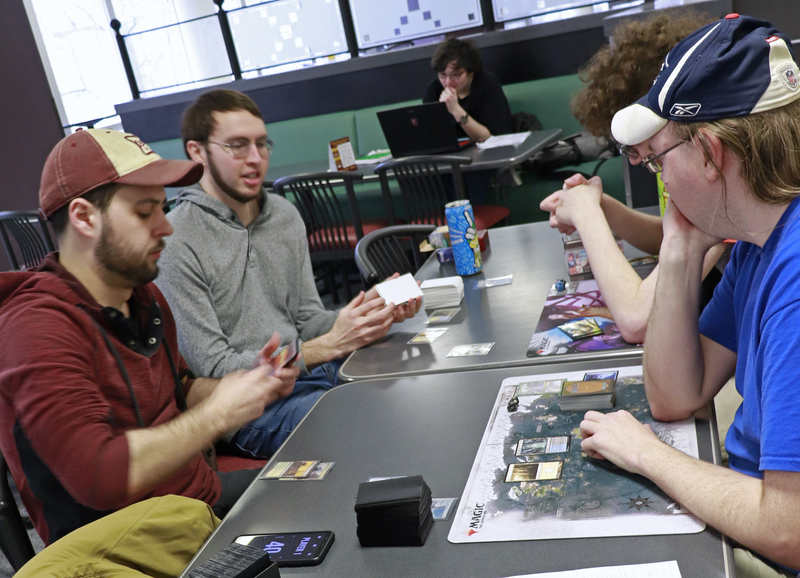 In their mission statement, Wizards of the Coast says inclusivity and empowerment are two of their biggest focuses as the game continues to grow in popularity. Bernardoni said she’s never had a bad experience playing D&D or felt excluded from a group because of her gender. For the women who play D&D, they can create and explore their ideas of what powerful strong female characters are, something the media often lacks. There is no shortage of strong heroic male characters, look at all the Marvel movies or “Lord of the Rings” for example, but often we’re missing female characters that are more than just beautiful noble martyrs. The beauty of D&D is that female players are the strong powerful characters they desire to be. Sophomore Danielle Corrie said she joined the club because she loves playing table top games and that the club is welcoming to all people. As Dungeons and Dragons becomes more mainstream due to pop culture and availability online, club members look forward to welcoming more people to join them Thursday nights in the UC Down Under at 6 p.m.
Separator image Posted in Art, Art, Arts & Entertainment, CMU Alumni, College Life, Community, Events, Events, Pop Culture, Student Lifestyle, Students and tagged with Dungeons and Dragons, Liv Alexander, Mount Pleasant Gaming Association, Sarah Clinkscales.